There’s no goblins under the Story Bridge anymore, only top-quality bars, restaurants, cafes - and even a brewery. 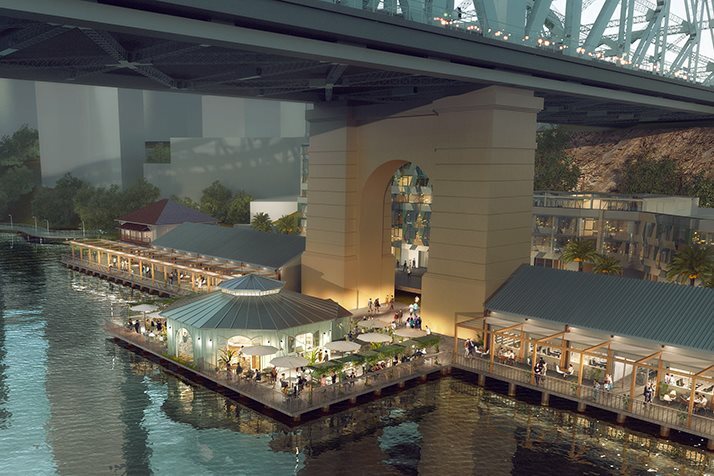 Brissie is set to welcome a game-changing dining and lifestyle precinct in November, as Howard Smith Wharves opens the doors to the first of their venues nestled amongst the cliffs under our iconic bridge. Overwater, a chic champagne bar inspired by the rotundas of New Farm Park, and Felons Brewing Co., a crowd-pleasing brewpub, are both set to open in November, bringing life to their section of the river’s edge for the first time in more than 50 years. Global hospo veteran David Finlayson is taking charge of the food and beverage offerings for the 2.7 hectare precinct, after helming the operations at Melbourne institutions Chin Chin and Kisumé, and helping to migrate the Chin Chin brand to Sydney. Though he admitted to looking forward to moving up for Brissie’s weather, David emphasised his interest in Brisbane’s thriving hospo scene. “Melbourne is different to Sydney and Sydney is different to Melbourne, and Brisbane is definitely up-and-coming. There’s a lot of good food in Brisbane… and a lot of chefs with big names are looking into heading here in the next five to ten years,” he said. As Director of Culinary, David’s set to have a finger in a lot of pies (and maybe some actual pies), ensuring consistency and quality across the many venues at Howard Smith Wharves. “I’ll be the gatekeeper to all the food outlets to make sure we’re going in the right direction, and making sure we have the right people in the right roles,” he said. The top-quality nosh doesn’t stop at the restaurants though, with David mentioning that Howard Smith Wharves will be hosting riverside farmers markets as well. It isn’t just diners who’ll be winning at Howard Smith Wharves, with David emphasising a commitment to nurturing young chefs. “It’s important to me that we set HSW up as a culinary hub for chefs to come to and work. There’s a lot of stigma that comes with being a chef – long hours, hard tasks, getting yelled at – but it’s about trying to change that now,” said David. With bars, restaurants, cafes, and even a functions space, Howard Smith Wharves offers a range of experiences for all ages, lifestyles, and price points. As for David’s ideal night at the wharves? Howard Smith Wharves’ Overwater Bar and Felons Brewing Co. are set to open their doors in November, so mark your diaries and prepare to enjoy late spring drinks by the river!